It is interesting how many churches in my denomination remove the term “evangelical” from their church name. I understand there is a national trend in America to call churches “Community”, “Independent” and “Bible” while removing denominational tags like Baptist and Assembly of God, etc. In fact, I have witnessed more one name churches in the past year than I did in the past 15 combined. Names like Ascent, Passion, and Harvest are more the norm than the church I served at, Columbus Evangelical Church. I have been told there also is the reason of having the mission/vision of your church in your name, hence names like Hope Church and Faith Church or even House of Prayer (our newest name of a church plant in Wyoming). I get it. I found myself wondering, “Why have we resisted globalization?” and it is in that question I will focus the remainder of this blog post. This question has almost made me pull a muscle in my brain. Especially when thinking about Jean’s research topic of immigration. Why do we fight it so intensely. Is it mis-trust? Probably, or perhaps it is control. Some control is necessary, no matter what anyone says. But control gone too far is manipulation and selfish. I also think fear is a part of the explanation of resisting globalization. This whole debate over the “wall” is fascinating, and exhausting. I will refrain from commenting needlessly on the politics of it, and only will say barriers have been a part of America since it’s founding–property boundary stones, white picket fences, barbed wire farms, gated communities, chain link fenced backyards–all are boundaries. What matters is what humans do with the boundaries, they can either divide needlessly, or define healthiness, mercifully. Like in Montana, I have heard ranchers say a hundred times, “The best gift between neighbors is a good fence.” It shows where the boundary is, but it does not take out the fact that the ranchers still have to be good neighbors who work together, support one another, and build positive relationships together. Perhaps Christians have resisted globalization because there are negative connotations from several Biblical end time prophecies. One world currency, the mark of the beast, the earth being united for 3 1/2 years in the tribulation. I can understand the concern, but Christians do not have to live in fear of these, at least not compared with the eternal promises of Christ. Perhaps we resist globalization as Christians because of our concern over compromising our beliefs. We worry that to be global we may have to work with Muslims, Hindus and the like. What Christian parent hasn’t struggled with their children being exposed to other world religions in a reverse-evangelism way? We also resist globalization because of Darwin, Marx, intellectualism and science as a whole. Seen as the enemy to our Biblical beliefs, we won’t let anyone in who thinks differently than us or has a different world view. Obviously, in our “Elite 8” Cohort, we are all open to globalization. We entered a program called “Leadership from a Global Perspective.” We all cherish our international experiences, we love our Zoom’s with a Canadian, French, English, Chinese and American perspective. We brag about our cross cultural experiences in our own contexts. In closing, I choose to be open to the globalization touted by Billy Graham. At age 31, his “crusades” spanned governments, continents, political affiliations, and even racial lines. No person in my memory has better reached across the aisle and ministered to Presidents and Prime Ministers, Priests and Nuns, Nones and Dones, like Billy Graham. How did he do it? As far as I can tell, he got back to the Gospel, stuck to the Gospel, didn’t water down the Gospel, and loved EVERYONE with the Gospel. He was a true person of the Good News. What a great example of globalization done right! Bebbington, David W. Evangelicalism in Modern Britain: A History from the 1730s to the 1980s. London: Routledge, 2015. 2-17. Lewis, Donald M., and Richard V. Pierard. Global Evangelicalism: Theology, History and Culture in Regional Perspective. Downers Grove, IL: IVP Academic, an Imprint of InterVarsity Press, 2014. 21-22. Eckhardt, Brian. The Discipline of The Evangelical Church. Salem Evangelical Church, 2014. I like the idea of evangelical meaning transformation. We do require an ongoing transformation…that for me is a better analogy than whittling wood. Sounds less painful :-). Beautiful quote from Schmidt and so true in a world that loves to counts (as Kyle says) the 3 B’s. -Budgets, Buildings and Butts-yet we can not truly count the most important things…love it! 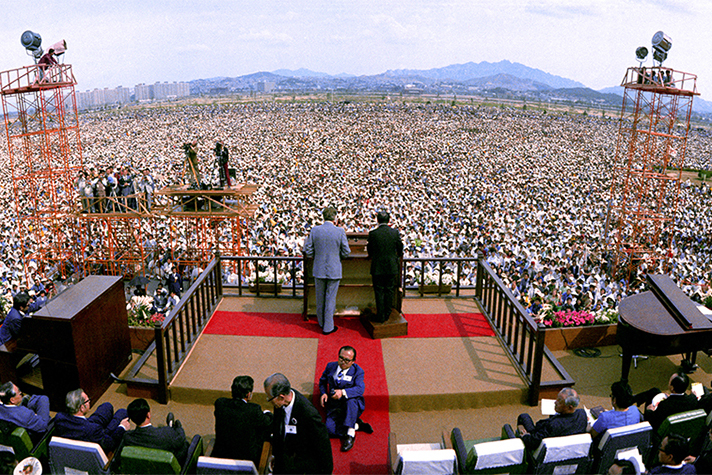 Billy Graham’s influence will be known for a long time. Not being in the states, I don’t have the same news and daily influences as most US residents have. I do know we reflect what we read and what we listen to. I had a German man say to me last week, “What is up with the US and this Wall?….we’ve done the wall thing, it didn’t work and we tore it down.” He was being funny but I know that this is extremely divisive in the nation right now. As a leader Jay, how do you encourage your leaders through this time that is dividing the people of God? It was interesting to see evangelicalism from the standpoint of Bebbington and now Lewis and Pierard. They both present the genesis and journey of evangelicalism through their own distinct lens and perspective. I currently attend an Evangelical Free Church in New Jersey, which has inspired many interesting conversations amongst my peers, many of whom see evangelicalism through a tainted view due to the media’s portrayal. I differ with some of the church doctrines where I currently attend; however, I’ve found that the leadership is open to differences in the spirit of unity. However, many of my unbelieving friends are leery of visiting my church because it’s labeled as evangelical? Do you find that members within your denomination have varied views and reactions to evangelicalism based upon their generation? Do you find that young people are leery of attending a church labeled as an evangelical denomination? I was in Billy Graham’s home town earlier this week for training and enjoyed reading about Evangelicalism and how he contributed to advancing the “good news” about Christ. How does one resist globalization like it is voluntary decision we must make. How arrogant we must be, right? Like information technology, e-commerce, m-commerce (mobile), and the 4 horsemen of the apocalypse (Google, Facebook, Amazon, Apple), what choice do we have? I climbed the mountains and walked beside the historic Kabul wall that was reportedly built in the 4th century to keep out advancing armies. It was about 30ft tall and 10ft thick. As massive and impressive as the wall was, it could only slow down the advance of evil, and eventually the country was overrun and occupied. I agree with Jay, we all need to be “true” to the Good News of Jesus Christ, no matter what names they come with to describe it. What a rich trip you had to Billy Graham’s backyard. I look forward to hearing more about it. These photos are phenomenal, Jay. I could stare at each of them for hours. They are so rich and tell so many stories, so dense with meaning and hope and courage and the Holy Spirit. I wonder about a fence between neighbors and a border wall, and whether they are comparable. I’ll have to think more on it. I am reminded, though, of a professor of mine who said that in America (and probably all over the world actually), the further you climb the economic ladder, the more isolated you become. You start out in an apartment, surrounded by people all over with little privacy. In this setting, you’re forced to deal with your neighbor. Then you make some money and you get a condo, and then a little house with a yard, and then a house with a bigger yard and a fence all around, and then you move into gated community (as you said), and then into a house with a gate within a gated community, and on and on it goes…unless, you decide to live according to the way and teachings of Jesus (I suppose), where you choose to live more simply, and in community, and with generosity and open-handed hospitality. I don’t always know how to reconcile this with the need for boundaries, other than to say that I do agree that healthy boundaries are actually reflective of loving relationships. I’m just not sure that Mexico and the U.S. has a loving and equitable relationship, and that’s really the thing that needs work. We’re wasting our time talking about a wall when we should be talking about how we can help lift one another up. Your points are phenomenal Chris! I especially liked the thought about economics have an impact on isolation. I had never thought of that before. Thank you so much for sharing them with me. I think you are correct in your suggestion that there are some deep seated fears regarding globalization in American Evangelicalism. On the surface they may seem reasonable, even prudent, but they quickly become means of labelling the ‘other’ and eliminating any positive dialogue. Those of us in this program are probably more open to the discussion than others who have not had the opportunities we have shared. How do you think we should pass on our knowledge and experiences with our more closed-minded brothers and sisters? What should be the goal of those conversations? This is a very helpful, wise word in the middle of a polarizing debate. Wall or no wall, it is really a secondary concern. What matters is how we treat our neighbour. I would also agree with you that fear is the main driver behind the debate today, not the motivation that healthy boundaries make good neighbours.